A King of Infinite Space: Euclid I.
Euclid. 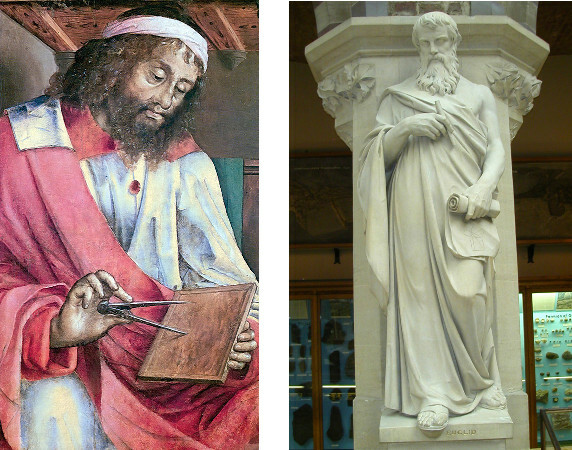 Left: panel from series Famous Men by Justus of Ghent. Right: Statue in the Oxford University Museum of Natural History. The Elements – far and away the most successful textbook ever written – is not just a great mathematics book. It is a great book. There is nothing personal in the book, nothing to give any clue as to the author. Yet virtually everything of importance in classical Greek mathematics is contained in it . Almost nothing is known of the life of Euclid. He flourished in Alexandria around 300BC. He may have taught at the great Library of Alexandria, founded by Ptolemy I. He may have attended Plato’s Academy. Plato (428-347 BC) was devoted to geometry and, allegedly, the inscription over the entrance to his Academy read “Let none but Geometers enter here”. Euclid came, perhaps, fifty years after Aristotle (384-322 BC) and was certainly familiar with Aristotle’s Logic. Euclid organized and systematized the work of earlier geometers, also adding substantially to their work. His system, which was truly innovative, relied on basic assumptions, called axioms and common notions. Most of these might be considered as beyond dispute, for example “if equals are added to equals, the wholes are equal”. Who could argue with this? Today, we might write “If A=B and C=D, then A+C=B+D”. Euclid imposed an order on mathematics, creating an axiomatic system that endures to this day. His aim was to deduce a large number of theorems or propositions from a small number of assumptions or axioms. Indeed, he proved nearly 500 theorems from just five axioms. The deductions had to be logically unimpeachable, with each step following clearly from the one before. The organization and structure of The Elements is brilliant. It begins with definitions: “A point is that which has no parts”; “A line is length without breadth”. There are in all 23 definitions. Then come five axioms and five “common notions”. The axioms, or postulates, are specific assumptions that may be considered as evidently true. Two of the axioms postulate that it is possible to draw a unique straight line between two points, and to describe a circle with a given centre and radius. The idea of using straight-edge and compass are implicit in these axioms; Euclid does not actually mention these instruments in the axioms or elsewhere in The Elements, but they are essential to his geometry. The common notions are more general than the axioms, and are suppositions “on which all men base their proofs”. The Elements is arranged in thirteen books, in which nearly 500 propositions or theorems are proved (467, to be precise). Book I has 48 propositions or theorems. The first concerns the construction of an equilateral triangle, a three-sided figure all sides having equal length. Theorem 4 states that two triangles having two sides and the angle formed by them equal are congruent, or equal in all respects. Euclid’s proof involves the movement of triangles, something not justified by him. Indeed, this is just one of many shortcomings identified by modern commentators. The tension builds up through Book I from one theorem to the next, leading to an impressive crescendo, the proof of the Pythagorean Theorem and its inverse in Theorems 47 and 48. Known to the Babylonians and rediscovered, around 500 BC, by Pythagoras — who sacrificed an ox in gratitude for the discovery — but rigorously proved here, perhaps for the first time, by Euclid. The final book, Book XIII, presents the theory of the three-dimensional solids known as the platonic solids. Each of these has faces that are regular polygons, with all faces identical and all angles between adjacent faces equal. The best known is the cube, with six similar square faces. There are no more that five such solids, and this was known to the classical Greek mathematicians. There are schematic illustrations accompanying every theorem. These are an ingenious means of clarifying the mathematical proofs. What were Euclid’s original diagrams like? Who drew them? We have no idea. The trail back to the original Greek sources goes cold around 850AD. No original writings of Euclid’s Elements remain, just copies of copies, some translated from Greek to Arabic to Latin and back to Greek again. During the Renaissance, the western world learned of Euclid from Arabic translations of the Greek text, further translated into Latin. The earliest surviving version of the Greek text is the “Vatican Euclid” (Vat. graec. 190) dating from the ninth century. The oldest surviving translation into Latin was by Adelard of Bath (c. 1080-1152), a 12th-century English natural philosopher. More on Euclid to follow later.